The Midwest Racing Connection was first published in 1995 and is the only publication that focuses specifically on events at NASCAR sanctioned short tracks in the upper-Midwest and to a lesser degree on other regional tracks. Print versions are available May through October and digital online versions of our publication are available year-round via our website. FYE Motorsports Promotions was created in 2003 by longtime race fan and nationally-known announcer Chris Stepan. Stepan has been a race fan all of his life and took his passion for the sport to the next level when he began announcing at the legendary Cedar Lake Speedway in his hometown of New Richmond, Wisconsin. Since FYE's creation, the promotions company has become known for promoting large scale special events across the nation, most notably the Viking Fall Classic and Minnesota Modified Nationals events in Minnesota; the John Seitz Memorial Late Model Invitational in North Dakota and the Street Stock Little Dream Race, the Eric Herbison Memorial and the Lake Superior Showdown in Wisconsin. Snowball Derby week will get a fun sendoff with good food and top short track racers mingling with fans during the 7th Annual Speed51.com Snowball Derby Kick-Off Party presented by Anderson’s Maple Syrup on Tuesday, December 1. 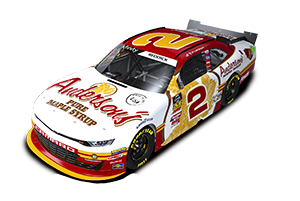 Anderson's Maple Syrup is featured in the 2015 New Hampshire Issue (volume 3) of Pole Position Magazine, describing how Nascar has paid dividends for Anderson's. Click here to watch a promotional video featuring some of our products. The February-March digital edition of NASCAR Pole Position magazine is now available. 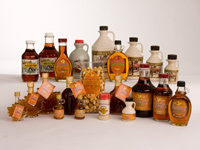 Anderson's Pure Maple Syrup is featured on page 11. Visit www.nascarpoleposition.com to view the digital edition. The printed edition is available in each respective race market in the week leading up to the race. Additionally, Anderson's Pure Maple Syrup is featured in ROAR! magazine, a digital magazine published weekly during the NASCAR season. Are you a racing fanatic? Would you like to get in on pit passes, race tickets, collectibles, and attend special events with drivers and crew? That's what we are all about! MRN Personality Steve Post co-hosts "Fast Food" on MRN.com each Thursday during the race season; a place where "great eating and great racing collide in what is always a tasty and winning combination." 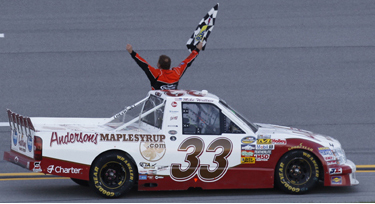 Anderson's Maple Syrup, Inc. and 2011 Nascar Camping World Truck Series team Kevin Harvick, Inc., teamed up in the Camping World Truck Series on October 22nd, 2011 at the Talladega Superspeedway. NASCAR veteran Mike Wallace drove the #33 Chevrolet Silverado to victory lane! Mike Wallace's Big Win at Talladega in 2011.